Glossy Czech Military Wing Tip Shoes, ready to add impeccable Old World good looks to any engagement. Czech Military Surplus Leather Dress Shoes, New is rated 3.7 out of 5 by 6. Rated 4 out of 5 by Daniel from for less than 20 bucks, they're amazing Im usually a 10.5 so since theres no in between sizes I ordered a 10, and that worked ok, little snug and a hair thin but again, they are what? 18 bucks? well worth it. Rated 5 out of 5 by Aaron from Superior Quality and Price These shoes LOOK very similar to Bata Shoes. These "might be" from Bata's first factory when Czechoslovakia still existed under the name CEBO, a Communist state ran organization in Zlin, Czech Republic. These are NOT BATA SHOES NOR DO I MAKE A CLAIM THEY ARE. They may or may be or not from Zlin. I ordered 4 shoes. This time, I ordered 2. 3 of 4 were "might be" made in Zlin, Czech at the CEBO Factory. The Other was made in Somewhre in Slovakia, still very high quality. The shoes carry a different name under the state ran regime. A very similar look sell for around $45-$110 USD in Switzerland, depending on how new the model. This is a cheaper alternative. I claim they are related because these are assumptions based off some historical research and this is purely an opinion. 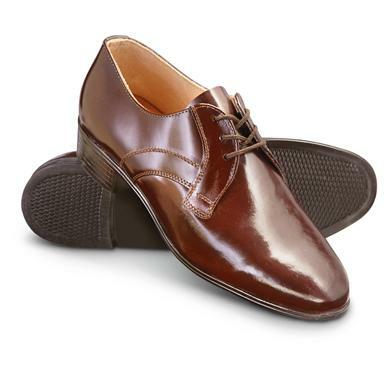 Rated 5 out of 5 by DRS1 from Nice dressy shoes at a bargain price These are very nice shoes and look sharp while not costing a lot. They are very comfortable and I wear them at work and for casual wear. Rated 2 out of 5 by yalc from Cheap Was disappointed in these shoes. The ones in the photo look nicer. The ones I got look and feel thin and cheap. Rated 1 out of 5 by DAVID ALAN from Defective and damaged and poor quality. Rated 5 out of 5 by LANCE A from They fit very good and looking good.